We wouldn't want you to overspend on apps and games, even really cool ones. 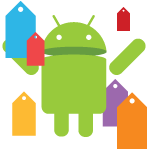 That's why we keep an eye on the sales in the Play Store. Here's another batch of discounted apps just in time for your weekend.